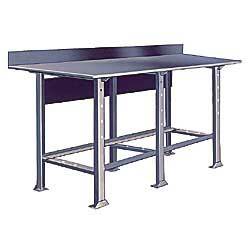 Heavy-duty bench has a 3/8" steel plate top with a 12-gauge back plate. The bench top is supported by all welded legs made of 2" x 2" x 1/8" angle. A formed 12-gauge stringer and angle tie rods are provided with all benches for maximum strength and rigidity. Optional drawers and a lower shelf in place of tie rods are available also. Ships knocked down. Bench height 35". SPECIFY FINISH: GN - Green, GY - Gray. FOB ILLINOIS. XG-5408GN 191	 Green	 2	 48" x 24"
XG-5408GY 191	 Gray	 2	 48" x 24"
XG-5409GN 225	 Green	 2	 48" x 30"
XG-5409GY 225	 Gray	 2	 48" x 30"
XG-5411GY 292	 Gray	 3	 60" x 30"
XG-5411GN 292	 Green	 3	 60" x 30"
XG-5413GY 337	 Gray	 3	 72" x 30"
XG-5413GN 337	 Green	 3	 72" x 30"